Today we want to show you some differences between Swimmo Training Watch and a newcomer among swim watches – Series 2 of Apple Watch. Of course, both products are different and serve different audiences so we will focus on the aspects of the watch that are aimed at swimmers. The first thing we want to compare is the ways you can control the swimming features on both devices. 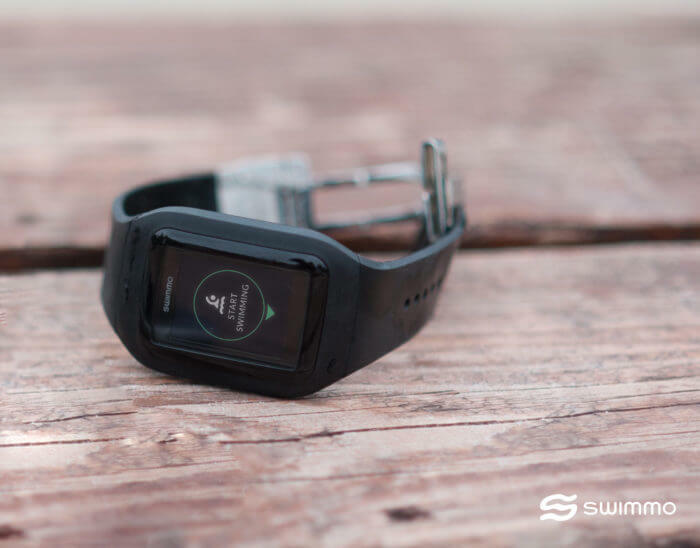 Swimmo was designed from the very beginning to be used in the pool and all the technology going into the device had to serve this purpose before anything else. A very good example is our display tech that stays active and functional while fully immersed in the water. This allows our Rotate&Tap system to be as functional outside as they are in the pool. Using flicks of your wrist and taps on the screen you can choose and select any Swimmo’s feature. Apple Watch Series 2 display uses technology that could result in fake random taps while in the water. That’s why the touch display has to be completely disabled before going to water. The only controls you keep while swimming is by using the digital crown to choose one of three possible types of metrics visible. Swimmo on the other hand besides the main metric in the big font will continuously provide all of them on the bottom of the screen. During the keynote, everybody was impressed by the water injection system using Apple Watch’s speaker to remove water from the device. The only reported problem with that technology is that it doesn’t always work the first time which prevents touch screen from being re-enabled that probably can be a bit annoying if you spend a lot of time training in the pool. Swimmo instead of the speaker uses vibration motor to communicate with the swimmer and it is sealed shut preventing water from entering the watch. As Apple Watch Series 2 relies on the ability to sense your arm motion it won’t count your kick sets at all and with most technique drills it might get lost if your movement is not perfectly rhythmical. Understanding the importance of drills in developing style and efficiency in the pool Swimmo created Kick and Drill Sets Mode that allows you to measure these types of workouts. During your set, you can switch to this mode with just a few taps! One of the things many reviewers who were also avid swimmers pointed out is the limitation of the stroke detection of Apple Watch Series 2 that detects the stroke only if the whole workout is done using one style. If at any point you change the stroke during the training it will show up as ‚Mixed’. In the upcoming update for Swimmo, we will add stroke detection that will be able to recognize the stroke for every lap separately so you are not limited to one style per workout. On top of that, Apple Watch Series 2 is a considerable expense without Swimmo’s 35+ swimming features. So if you take swimming seriously we believe Swimmo is the right choice and will make swimming more fun and more efficient!